The six-way intersection of North, Damen, and Milwaukee is the beating heart of the Wicker Park-Bucktown area, but it’s a highly dysfunctional junction. Last night some 90 residents turned out for a community meeting where the Chicago Department of Transportation presented plans for short-term, forward-thinking improvements to the intersection that will make it safer for all road users. CDOT also discussed proposed changes to the entire Milwaukee corridor from Division to Western, including the possibility of stripping parking from one side of the street to make room for bike lanes. The event at Pritzker elementary school was co-hosted by Wicker Park Bucktown SSA #33 and the three local aldermen, Joe Moreno (1st), Brian Hopkins (2nd), and Scott Waguespack (32nd). Mike Amsden, CDOT’s assistant director of transportation planning, presented the proposed changes, which were previously discussed in the Wicker Park Bucktown Master Plan. The idea is to implement “low-cost, quick-hit pilot projects that are prioritized and supported by members of the community,” he said. The changes will primarily be made using paint and flexible posts, rather than more permanent materials like concrete, so they can be modified if issues arise. 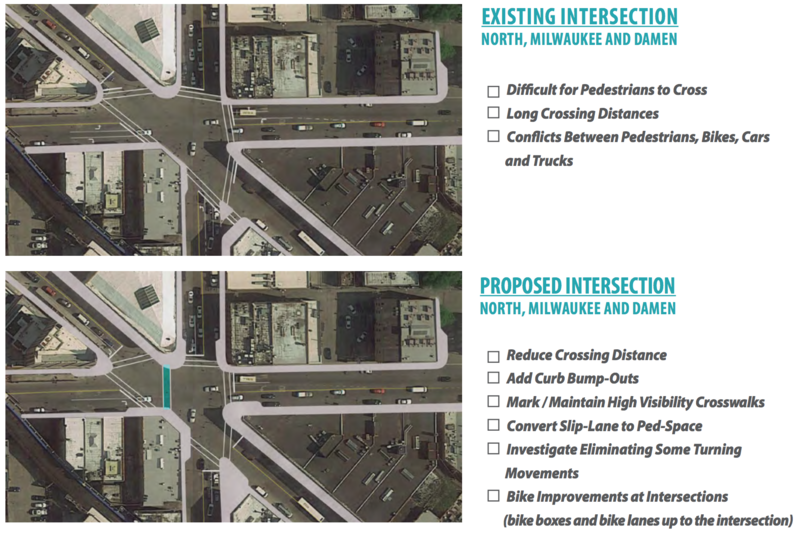 Amsden noted that the master plan calls for adding a new crosswalk at North/Damen/Milwaukee to connect the southwest (Starbucks) and northern (Walgreens) corners. While it’s currently illegal to make this crossing directly, it’s a common move during peak hours, and he admitted that he’s crossed this way himself on occasion. The master plan also calls for curb bump-outs to shorten pedestrian crossing distances and discourage fast turns by drivers, which could be done on a temporary basis with paint and posts. In addition it proposes closing the slip lane at the southern corner of the intersection, as well as possibly banning some turning movements by motorists, and/or removing some existing turn lanes. The master plan calls for adding bump-outs and a new crosswalk, and eliminating the slip lane. The master plan also calls for making people-friendly changes along the entire Milwaukee corridor in the neighborhood, including adding bump-out, eliminating some turns and turn lanes, and possibly lowering the speed limit to 20 mph. When Amsden brought up the possibility of removing parking from one side of Milwaukee to allow for bike lanes, many people in the audience cheered (lots of folks had shown up on bikes). A woman near me exclaimed “No, no,” and shook her head. Amsden noted that Milwaukee is a high crash corridor, with 1,097 collisions between 2010 and 2014. While only 20 percent of the crashes involved pedestrians and bicyclists, these vulnerable road users were involved in 66 percent of injury crashes, and 68 percent of collisions with serious injuries. There were 74 reported dooring crashes on the corridor during this time, accounting for 6 percent of all reported doorings in Chicago. 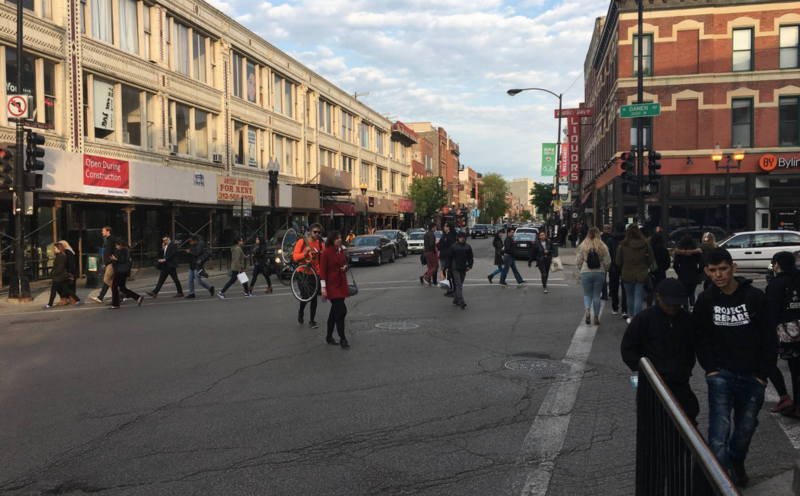 While Amsden said CDOT was aware that North/Damen/Milwaukee had lots of foot traffic, “we were shocked” at the numbers that observations revealed: There are over 5,000 pedestrian crossings during the combined a.m. and p.m. rush hours. Moreover, the counts reveled a massive imbalance in the use of the slip lane: Over 1,000 people walked across it during the combined morning and evening peak hours, while a mere 32 drivers used it for right turns during the same times. These numbers show that only a handful of people would be inconvenienced by closing the slip lane, whereas more than 30 times as many road users would enjoy improved safety and convenience. Amsden added that about 400 people make the illegal crossing between Starbucks and Walgreens during peak hours, so a new crosswalk makes perfect sense. Crossing between the Flat Iron Building, at the east corner, and Starbucks is another common “pedestrian desire line,” he said. However, Amsden cautioned, adding a new crosswalk is more complicated than it might seem, because the Americans With Disabilities Act requires that any new crosswalks be wheelchair-friendly, so new curb cuts would be needed. Installing these wheelchair ramps would be a relatively expensive undertaking because of the presence of vaulted (hollow) sidewalks. There’s also a huge amount of bike traffic at the intersection – Milwaukee isn’t known as “The Hipster Highway” for nothing. Amsden said over 800 people ride through the intersection during the morning rush, comprising 40 percent of all traffic on Milwaukee and 10-12 percent of vehicles on Damen, according to counts conducted in April and May of this year. In recent months police have been ticketing southeast-bound cyclists on Milwaukee for making a harmless move I call the “Six Corners Shuffle.” (Let’s save the debate over whether it’s appropriate to call North/Damen/Milwaukee “Six Corners” for another day.) Bike riders cross from the Northwest Tower (now home to the Robey Chicago hotel) to the Starbucks while pedestrians have a walk signal to cross the west leg of the intersection, but vehicular traffic on Milwaukee has a red. There, they wait until Milwaukee gets a green to proceed, which gives them a jump on motorized traffic. I knew the Six Corners Shuffle was common, but Amsden said that it’s actually the default practice for southeast-bound cyclists – a full 65 percent of them do it rather than wait at the Northwest Tower for a green. Therefore it would make plenty of sense to legalize this move. Amsden brought up the possibility of adding a dedicated bike signal that would coincide with the walk signal on the west leg. As for existing conditions on the Milwaukee corridor, Amsden noted that while the street see 13,000 motor vehicles trips a day, it also gets 5,000 bicyclists. The popular #56 CTA bus route and lots of parking turnover and truck deliveries further complicate matters. One interesting stat he noted is that a full 25 percent of northwest-bound cyclists on Milwaukee get on the Bloomingdale Trail at Leavitt and continue west on the path. Amsden said CDOT will continue to collect data and community input through June and come up design concepts and preferred alternatives by July. There will be a second public meeting in mid-July, and the department hopes to begin construction in August, wrapping up by the end of the year. 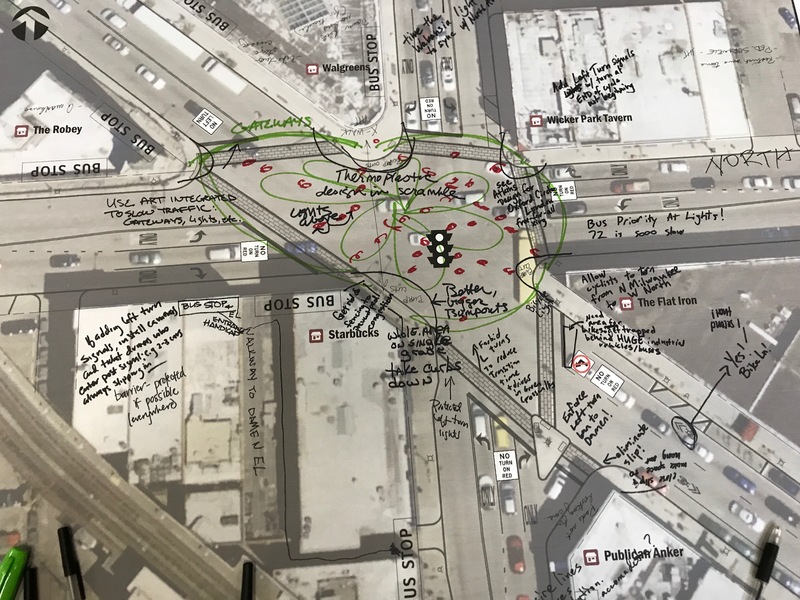 During the Q & A period, a resident asked whether a pedestrian scramble would make sense for addressing North/Damen/Milwaukee’s pedestrian access issues. Amsden replied that the ADA act rules would require every possible crossing to be safe for people with disabilities, so the length of the longest crossing, between the Northwest Tower and the Flat Iron building, would require a minute-and-a-half walk signal. “That would probably frustrate everyone and not make it better,” he argued. Check out CDOT’s presentation from the community meeting here. Great report. Although Milwaukee is the shortest/most direct route for me to commute, I very rarely take it and this screwball intersection is one of the major reasons – conflict with people parking/exiting parked cars between here and Division and Ashland being the other. Removing the slip lane is a no-brainer, removing a parking lane would actually qualify as visionary (and fairly common sense given the Damen stop is right there). While most of this stretch won't be getting bike lanes in the near future, a number of bike- and pedestrian-friendly changes are planned for later this year.